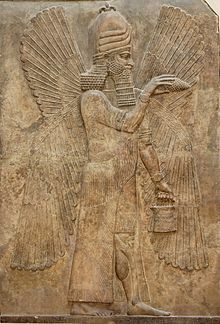 Ancient Assyrian stone relief of a genie. Genies or jinns or djinns are supposed to be magical beings or creatures with free will. They are originally found in ancient myths and legends of the Middle East, especially Arabia. Nowadays, people in many Muslim countries like Saudi Arabia, Kuwait, Qatar, Lebanon, Palestine, Egypt, Iraq, Syria, Libya, Algeria, Tunisia, Turkey, Iran, parts of Central Asia, Afghanistan and Pakistan believe in these Jinns or Djinns. Jinns are also common in legends and stories from the Middle East, for example in the One Thousand and One Nights. The holy book of Muslims, the Quran also mentions Jinns, and says that they are made from fire or smoke. Together, the jinn, humans and angels make up the three wise creations of God. Like human beings, the jinn can be good or bad. A genie who lives in an lamp can be seen in the famous story Aladdin. When the lamp is rubbed, the genie appears from the lamp with a cloud of dust. He has the power to grant wishes. I Dream of Jeannie was a popular television series in the 1960s about a female genie, named Jeannie. In the famous 1924 film The Thief of Bagdad, there are many Jinnns/Djinns, who are shown with magical powers. This film was remade in 1940 and 1942, also. This page was last changed on 23 February 2018, at 10:34.